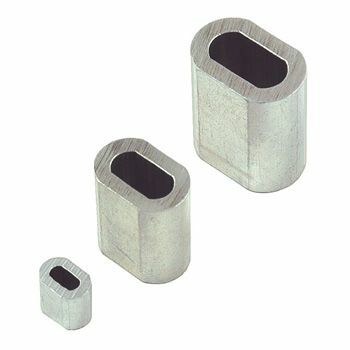 Aluminimum Ferrules for forming or crimping eyes on galvanised steel wire rope. The ferrule size relates to the wire rope diameter, so for a 3mm wire rope you use a 3mm ferrule. For best results a crimping tool should be used. Type A ferrules manufactured to conform to EN13411-3. Please note that aluminium ferrules should not be used in marine or coastal environments with stainless steel.